New concept from Gray-Nicolls. All in one padding protection system. 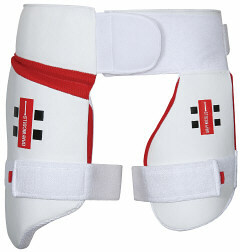 Adjustable thigh and inner thigh pad. Velcro adjustment for superior fit. Contoured lightweight high density foam designed to move with your body. Breathable mesh lining for improved ventilation Sizes Youths or Mens for either RH or LH players.